6.1. Across the UK, after housing costs are taken into account, there are 13.2 million people (21%) on relative low income. income of the year in question. 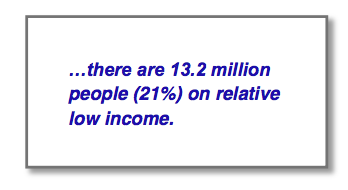 For 2013-14, the relative low income figure, after housing costs, was £232 per week.